There is something not quite right about they way the DLSU Green Archers defeated the San Beda Red Lions, 71-66, in the final of the Fil-Oil Flying V Hanes Premier Cup at the Fil-Oil Flying V Arena in San Juan yesterday. The game was fine. San Beda looked good three-fourths of the way until going cold in the endgame, thus allowing the Green Archers to claim their third Fil-Oil championship since the pre-season tournament began in 2006. I watched the Green Archers in this summer’s Premier Cup whenever I could; and while still obviously in pre-season mode, the team managed to hold off spirited rallies by opposing teams in two of the matches that I watched. The rest of the UAAP be forewarned! Even when I was in college, there were already debates among fans about which was the stronger league, the UAAP or the NCAA. A unified league will render moot such debates. And not just for basketball. Not too long ago, the same team wilted with alarming regularity in the endgame; but under Juno Sauler the players have not only acquired mental toughness but, more importantly, the winning habit. Yesterday against San Beda, the Green Archers were down by 12 late in the game but then turned on the afterburners to leave the Red Lions wondering what in the world hit them. It was as thrilling as basketball games can get. What a pity, then, that it was still, despite the organisers’ attempts to hype it up, ‘merely’ the championship of a pre-season tournament, one used primarily by coaches to get the boys fit and to help them make their minds up about fringe players. The fans know it, too! The San Juan Arena is not exactly the largest of venues; but even in the knockout stage of the competition, the empty seats were almost an embarrassment. Yesterday’s final should have been a sold-out game either at the MOA or at the Araneta Coliseum with the pep squads of both schools in full attendance and the bleachers turned into a sea of green and red. Instead, for all concerned, now that the Premier Cup is over and done with, the time has come to buckle down to the ‘serious’ job of trying to win the leagues that matter: the UAAP for the Green Archers and the NCAA for the Red Lions. Am I the only one who thinks that this is not right? 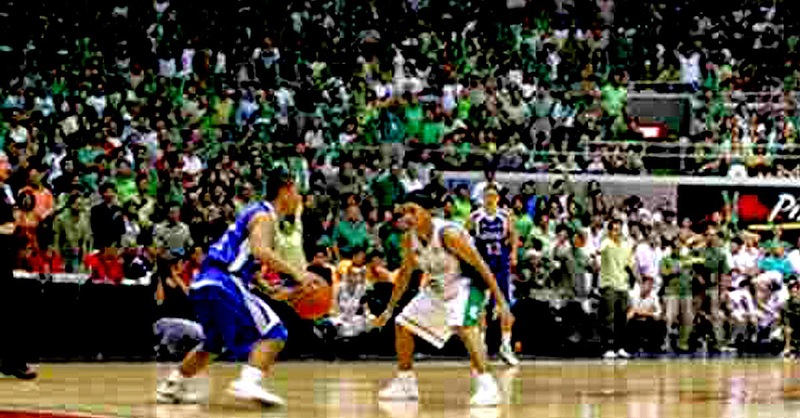 DLSU came to the Premier Cup as UAAP champions. The Red Lions, on the other hand, are the reigning UAAP champions. The Centro Escolar University Scorpions, who finished third, are the NAASCU champions. The eventual fourth placers are the SWU Cobras from Cebu. Logically, you use a smaller tournament to prepare for a big tournament. The UAAP has eight member universities. The NCAA, meanwhile, has 15 colleges and schools. The Premier Cup has attracted the member schools from both leagues along with the champion of the NAASCU as well as strong teams from outside Metro Manila. Yet, the Premier Cup – along with the Collegiate Champions League – is not considered as prestigious as the two essentially ‘smaller’ leagues. There is almost something parochial about this being so. It is as though everyone has a distinct preference for trying to be a big fish in a small pond than to really try to be the big fish in the ocean. It will probably be logistically implausible for the southern teams to come to Metro Manila on a regular basis; but the time is probably right for the metropolis’ major athletic associations to come together as one. For starters, each one calls itself whether directly or indirectly a ‘national’ association. A singular association will give the claim a bit more credulity. Whether a school calls itself a college or a university is really immaterial because, in all instances, member schools are expected to offer both secondary and tertiary education. And if there is still lingering concern about violence returning when the old foes from the NCAA face up to each other again, I think we all know the answer to this. Going coeducational has tempered the bleachers; and, in fact, even in the NCAA, the bleachers are lately more wont to scream than roar. What will probably prevent such a unified league from every materialising is that schools – of all things – can be so stuck in their comfort zones and be content with merely preserving the status quo. The semestral ‘sporting seasons’ have been used for so long that having more schools will inevitably bring logistical problems. On the other hand, there are always ways if one is willing to give it a try. Off the top of my head, teams can be grouped according to strength with promotion and relegation, as it is done in football. I know that these athletic associations are really much more than just basketball; but let us all be honest about it. Basketball is the flagship sport of all these associations.